four + three = Required Please enter the correct value. The First Solar stock price climbed 48.8% in 2015, compared to a drop of 2.1% for the S&P 500 during the same time. And we're confident First Solar stock will continue to outperform the broader market in 2016. First Solar Inc. (Nasdaq: FSLR) is the largest solar panel provider in the United States. The Arizona-based company commands a $6.2 billion market cap and owns some of the world's largest grid-connected photovoltaic (PV) plants in the world. It installed 1,023 megawatts worth of solar panels in 2014 – more than SolarCity Corp. (Nasdaq: SCTY) and Vivint Solar Inc. (NYSE: VSLR) combined. And First Solar stock is poised for more gains in 2016 as solar demand continues to grow around the world. Thanks to their rapidly declining cost, demand for solar panels is surging all over the world. And demand for solar panels has already been booming in the United States. According to the Solar Energy Industries Association (SEIA), a nonprofit dedicated to solar power initiatives, the number of solar panels installed in the United States jumped 30% from 2013 to 2014. The average price of solar panels has declined by more than 60% over the last five years due to their increasingly efficient production. This caused the solar markets in Asian countries like Japan and China to grow by roughly 10.4% and 17.3% in 2015. In fact, China has invested $83 billion in clean energy initiatives last year and will continue to build on them this year. "Solar power is currently booming all over the world," Money Morning Global Energy Strategist Dr. Kent Moors said in December. "There's now a confluence of technology and economy that assures these new energy sources will continue to be adopted and improved upon – at ever-increasing rates." India is making one of the biggest solar initiatives of 2016 for one simple reason – its current source of power is infamously unstable. The country has been trying to replace its faulty electrical grid for years now. According to Bloomberg, India has come short of every annual target to increase electricity production capacity since 1951. The problem made headlines in 2012 when the country experienced the largest blackout ever and left 700 million people without power. The Indian government will invest $100 billion to install 100 gigawatts of solar capacity by 2022. That's up from the country's current capacity of 4 gigawatts. As the developer of the largest PV grids in the world, First Solar is poised to fulfill these overseas initiatives. First Solar even helped build Australia's Nyngan solar power plant, which was completed in June 2015. With 1.4 million solar panels installed, it's the largest solar power plant in the Southern Hemisphere. The company said in its Q3 earnings call it expects to sell 2.9 to 3 gigawatts worth of solar panels in 2016. That's nearly a third of its total installed PV capacity at the beginning of 2015. 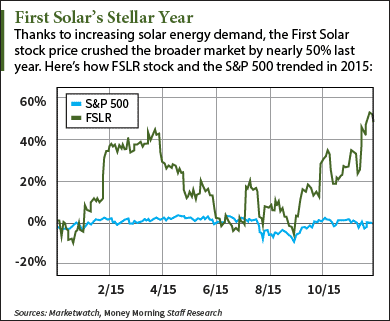 First Solar stock has also benefited from a series of stellar earnings reports. During the third quarter of 2015, the company posted an earnings per share of $3.41 on sales of $1.3 billion. That's a huge jump from $0.87 per share on $889 million in sales during the year-ago quarter. The company forecasts $4 to $4.50 per share on $3.9 billion to $4.1 billion in sales for full-year 2016. Yahoo! Finance analysts give the First Solar stock price an average one-year target estimate of $70.63. That would be a gain of 19.7% from today's opening price of $59. The Bottom Line: First Solar stock saw incredible gains in 2015. Now investors are wondering if shares of FSLR will be able to keep up in 2016. With demand growth showing no signs of stopping in the United States and Asia, First Solar stock is a valuable addition to your portfolio due to its dominant position in the sector. Alex McGuire is an associate editor for Money Morning who writes about energy. Follow him on Twitter for all of the biggest news on solar energy stocks.